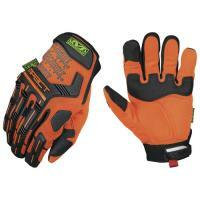 Mechanix Wear Safety M-Pact Impact Protection Gloves keep you visible and safe. Mechanix Wear constructs these Hi-Viz M-Pact® gloves out of AX-Suede™ and a reflective print for maximum visibility that won't get lost in the dark. Even the ink of the logo is reflective! The Safety M-Pact Gloves also feature ANSI-107 compliant TrekDry® technology to counteract heat, as well as Thermal Plastic Rubber (TPR), Impact Guard™, XRD®, and EVA foam for padding and protection against those everyday blows and pinches that come with the job. Mechanix Wear's impact protective gloves include reinforced and textured fingers to improve strength and grip and an Armortex reinforced palm.